Place : Sahdol District, Madhya Pradesh, in the central part of India. Major Attractions : Tigers, Leopards, Bears. Area Covered : 448 sq-km. Ideal Time to Visit the Park : Between the Mid-November to June. The park remains closed during the monsoon months from July to early November. Nearest Attractions : Kalchuri Archeological Remains, Bandhavgarh Fort (14th century fort). Some Major Accesses : Khajuraho (via Satna) 230 km, Varanasi (via Rewa) 340 km, Katni 75 km, Rewa 115 km, Umaria 30 km, Kanha 250 km. 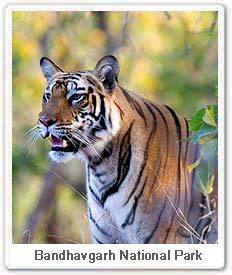 The Bandhavgarh National Park is located within the district of Sahdol in the central Indian state of Madhya Pradesh. The thick forest of Bandhavgarh National Park is nestled among the Vindhya hills. The Bandhavgarh National Park provides its own climate, atmosphere, water and nutrition through its recycling systems. Bandhavgarh experiences climatic conditions that vary to opposite extremes. The temperature in the winters varies from 0 to 20 degrees centigrade between November and February. In the summers, the temperatures move to the other extreme and can go up to 46 degrees centigrade. Bandhavgarh has an average annual rainfall of 1200mm. The rains here give very little prior warning. The rains, however, bring good respite from the burning heat. The main monsoon season mostly begins only once the park is closed from June to November. The Bandhavgarh National Park was once a hunting ground of the royal family of Rewa. Bandhavgarh was declared a park in year 1968. In 1968, the Maharaja of Rewa handed over the area to the government for it's formation. At this time, the entire park covered an area of 106 sq-km, but now, it consists of an area of 448 sq-km. These much required extensions, to the northern and southern areas, of the park were done in 1982. These areas consisted primarily of Sal forests, which is the main tree-areas found in the entire park along with Bamboo. In the year 1993, the Bandhavgarh National Park was finally declared a tiger reserve under Project Tiger. Bandhavgarh has a large variety of tree cover. Bandhavgarh has an excellent tree and foliage concentration. About half the Bandhavgarh park is covered with fine trees of Sal, while mixed forests are found in the higher reaches of the hills. It is only in the slightly higher lands that it changes to a more mixed vegetation of sali, saj, saja, dhobin etc. Stretches of bamboo and grasslands extend to the north. 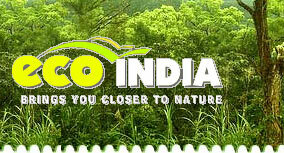 The main wildlife viewing is still done in the core of the park with its 32 picturesque, wooded hills. The density of it's big cat population has made Bandhavgarh famous across the globe. Bandhavgarh is blessed with a large variety of natives in terms of animals. It is possible to sight tigers, leopards, gaur (Indian Bison-although some say this is no longer seen), chital (spotted deer), Sambar deer, Dholes, nilgais, wild boars, chinkaras, sloth bears, rhesus macaques, chital, black faced langurs, jungle cats, hyenas, porcupines, jackals, foxes, wild dogs, chausinghas and ratels, among others. Despite being famous for it's four legged inhabitants, Bandhavgarh National Park is also a bird lover's paradise. Keep a look out for white browed fantails, steppe eagles, green pigeons, white rumped shama, grey malabar hornbills, black and white malabar hornbills (quite a rare sighting), blossom headed parakeets, parakeets, blue bearded bee eaters, green bee eaters, white bellied drongos, owls, Jerdon's and gold fronted leaf birds, minivets, woodshrikes and the lovely paradise flycatchers. One can enjoy exploring the wildlife in Bandhavgarh by two ways - Jeep Safari and Elephant Safari. Jeep safaris are undertaken during the early morning hours till evening. A forest department guide is always their with the visitors on these jeep trips taken inside the park. Elephant safari trips are organised for tiger tracking early in the morning. Air : Khajurao at 230 km is the most convenient airport connected to the park by various domestic airline services with Agra, Delhi, Varanasi. Rail : The nearest railhead Umaria at 30 km is on the Katni-Bilaspur section of South-Eastern Railway. Another convenient railhead Satna (117 km) is on the Bombay-Howrah main line of the Central Railway. 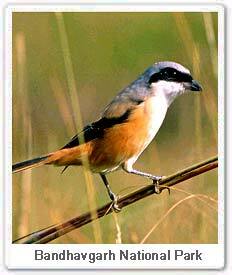 Road : Bandhavgarh National Park is situated on the Satna-Umaria & Rewa-Umaria highway. Madhya Pradesh State Transport Bus Services are also available from Rewa, Satna, Katni and Umaria.